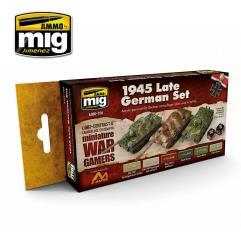 This specially designed set for Wargames that that allows you to easily paint late WW II German vehicles. 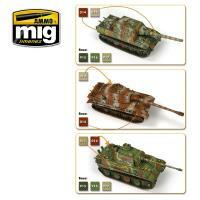 This set includes 3 colors needed to add lights, shadows and volume to the base color of your vehicle and common camouflages of the era. All 6 jars are acrylic and are formulated for maximum performance both with brush or airbrush and the Scale Effect Reduction will allow you to apply the correct color on your models. Water soluble, odorless and non-toxic. Shake well before each use. Each jar includes a stainless-steel agitator to facilitate mixture. Dries completely in 24 hours.